Scrub the potatoes under running water and cut off any gnarly spots, if using red potatoes, then dice them into bite-size pieces. Place into a pot with a strainer to steam and allow to cook until just tender (15-20 minutes). Alternatively, you could boil them in water but steaming them prevents a mushy texture. 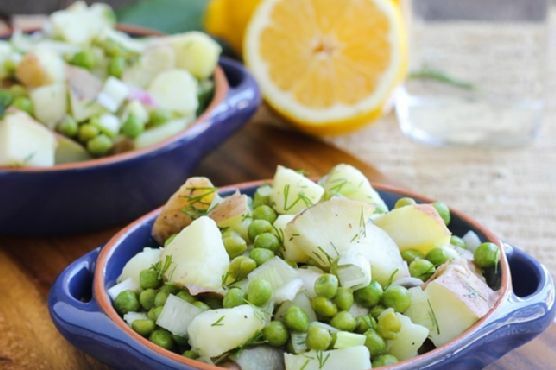 Once the potatoes are done, rinse them with cool water and then strain excess liquid.Next, transfer potatoes to a large bowl and then add the peas, onion, and dill. Pour in the vinegar, oil, salt & pepper and lemon juice then stir until potatoes are evenly coated. Serve immediately or store in the refrigerator for up to 2 days.